Implementing Infrastructure as a Service is a great way of streamlining and optimizing your IT environment by utilizing virtualized resources from the cloud to complement your existing on-site infrastructure. It enables a flexible combination of the traditional on-premises data center alongside the benefits of cloud-based subscription services. 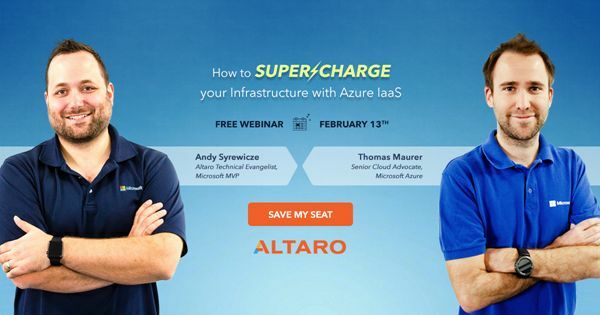 If you're not making use of this model, there's no better opportunity to learn what it can do for you than in the upcoming webinar from Altaro: How to Supercharge your Infrastructure with Azure IaaS. Once again, this webinar is going to presented live twice on the day (Wednesday 13th February). So if you can't make the earlier session (2pm CET / 8am EST / 5am PST), just sign up for the later one instead (7pm CET / 1pm EST / 10am PST) - or vice versa. Both sessions cover the same content but having two live sessions gives more people the opportunity to ask their questions live on air and get instant feedback from these Microsoft experts.